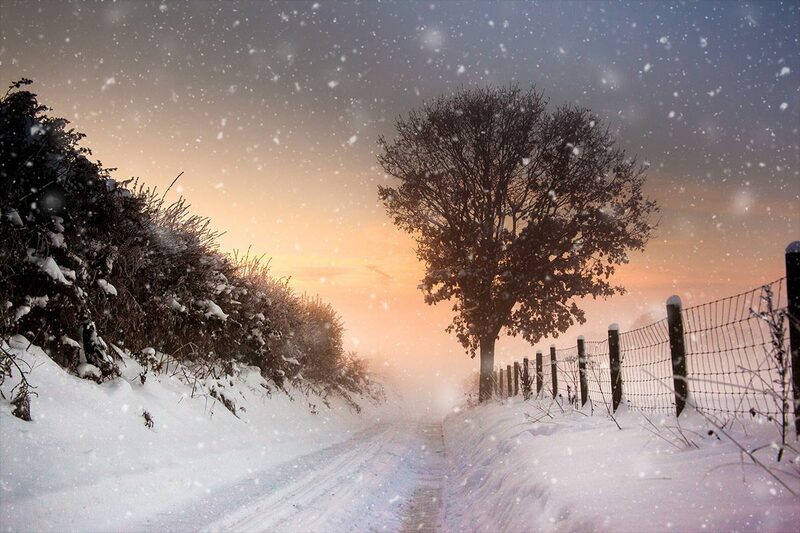 Here in the UK snow is something we get once or twice a year, which makes it a fairly rare event round these parts. So whenever snow arrives, everyone rushes out to build snowmen, go sledging and record the event with their cameras. Now I realise some of you get snow all the time and some of you never see snow from one year to the next, but don’t let that stop you enjoying this weeks Friday Freebie. This is a one click action, so once you’ve unzipped it and installed it, you only need to hit the play button. 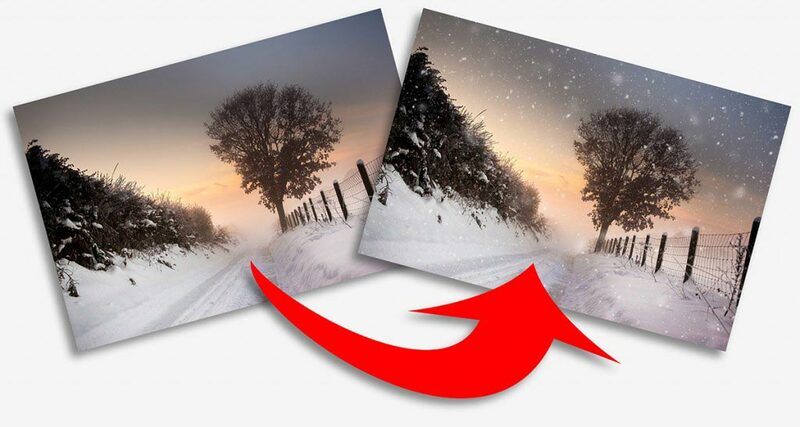 The first thing the action will do is to make a copy of your photo and it’s the copy that gets the effect, leaving your original photo untouched. The action will make three layers of snow and I’ve left all three layers active at the end of the action. That means you’re free to alter, adjust and tweak the snow in numerous different ways. Another nice feature of the action is the random nature of the snow. Put simply if you don’t like the snow the first time you run the action, just close the image down and run the action again and the snow will be different. The action is copyright Gavin Hoey 2013. You may use it for personal, non-commercial purposes only and please do not redistribute without permission. There is no support offered with this action and you use it at your own risk. Thank you and enjoy. Great Action & well timed! Thanks for the action, Gavin. I can’t wait to add it to my PSE 10 and give it a try. Where I live, it hasn’t snowed since 1939. Thanks for sharing, its like that i Norway too – its soo sad! Thanks Gavin for another great Friday Freebie. Loving this one. Please take a look at my shot with the action applied. Loving this one. Please take a look at my shot with the Instant Snow Action applied. Hi Gavin, Nice action. I have used it on my shots from Wimbledon Common this morning. Thanks Gavin, took some photos today in the snow so just about to add your action to them. Fabulous action Gavin! Love your work. On behalf of my computer and myself I would just like to say [ Thank You] one more time and because of you Gain, I look forward to Fridays. Thanks, Gavin! This will be fun to play with. Your generosity is appreciated! at first a huge compliment on your blog! I came across FStopperst on your site. You present all your themes totally understandable human but also professionally. And then there is something for free … rihaaa: D How cool is that? Thank you and do definitely keep it up! If you want to i can link your blog entry in my prescription of the pic? Is there a tut that i can purchase how u create the action? Just in time……. thanks, Gavin. Last week I took this picture of my dog, and yes…. it was snowing, but not enough. Now i’ve got 30 % more snow :-). I dragged the middlesnow layer into the original file and just dropped the opacity a few pennies. Thanks again. Grtz, from snowy Holland. Hi Gavin I’m all for Actions but i like them best of all when i have made them myself, I have a Mac and i have been trying for a Snow effect. Van Dar Lee seems to be just for windows. I have downloaded the snow effect you have here and it works well would you have a pdf of it. Sorry James, no PDF from me but feel free to make your own. Hi, I am running PS CS5. I downloaded the zip file, opened it and photoshop started up. Where is the snow option? When you said “Hit play” what did you mean, am I being a ding-bat! Love your tutorials, I have learned a massive amount. Thanks Gav, nice handy action to have especially round Chrimbo time. That’s great! unfortunately we never see snow here in Mexico. Cheers!! I just discovered your tutorials and they are most informative. I ran across this one, Instant Snow, and just tried it. I love snow. I applied it to a photo taken in Yosemite. It was snowing but the snow did not show in the photo well. Applying your snow effect has added the snow that I was trying to capture. Thank you very much for this. Love it. Hi Gavin, i used your snow action on a club competition print… Southwick…where you gave a great talk recently, and it was awarded a full 20 by a highly regarded local photographer / judge Ken Scott aka “Touching the Light”….. Thanks for all your hard work helping us mere mortals. Wow. Great action. Thank you for sharing for FREE!! Thank you SO much! I’m using it on a non-commerical school project. It’s not easy to take a photograph to theme ”winter portrait” when there’s no snow. So thanks again for saving my grade! As always thanks for everything Gavin!! Is there a way to receive the Instant Snow preset? I tried to download it , but my computer will not open your file. You’ll need to unzip the file (Right click on a Windows PC) and then install it into to Photoshop (drag and drop it onto the Actions panel). Sadly I cannot get this to work. Love how it looks though! Where can I find it? Plz. Hello. Your brushes are wonderful. Thank you very much. I have one question (stupid) – how do you instal snow preset? Thanks soooo much!! Great action, I just add a layer to each and tweek as needed. Greaaat job! Here are a few ive created so far. Gavin, I have been searching for a realistic snowing effect for some deer I photographed in the snow. Yours is the best by far that I have seen. There are some horrendous ones out there. Thank you so much. Just signed up to your newsletter as well. Thank you for this fun action! HI Gavin & Team. Just a quick note to say thanks for this action.I used it here for this years Cheesy Family Christmas Card. Hi Gavin, a great fun action to play with, thank you. Hey Gavin, will this work in Gimp? I’m too poor for PS. Thanks for the Snow effect will be using it soon as I get a chance on the right photo. Thanks Gavin, you’re a great teacher and an amazing photographer.. Thanks for a really great action! Is it just me or does the action downsize the picture? My original picture is 7360 x 4912 pixels, but after I have run the action the picture is 1708 x 1140 pixels. Hey! Thanks for the free snow! Can i use it for Lightroom? No, sadly there’s no brushes as such Lightroom. Thanks Gavin for your work and for sharing this action ! Thank’s for the great snow action. many thanks for your amazing snow action !!! Thanks sir Gavin for the amazing snow action.. Thank you for allowing the download…….looks really real. Thank you very much for this amazing action. It’s the best I’ve seen for adding snow. I love your work and all your help!! Thank you so much. ATN-file installing wont work in Lightroom —> LR-file cause i use it in Lightroom!? Help! Photoshop Actions won’t work in Lightroom. Thank you, Gavin! Useful action. Happy Holidays, cheers! Hi Gavin: While one has to go quite a bit south of Sydney to get snow (and not in December, mind you), this will allow me to at least pretend I can. Thanks for the snow action! I used the instant snow action a few times on different images, but recently I got to shoot outdoors when there was actual snow on the ground. I applied the action and this is the result. I love it! be able to obtain photos a fraction as well done as Gavin. thank you sir .. im from Malaysia like ur atr work very much ,, the best .. Thank you Gavin sir. I am from India and I have learned a lot from your videos from YT, Your simple tricks and ideas inspires me and forces me to push my boundaries to create something new. Thanks sir for being there for us and teaching us through your videos. Thank you for this. Your videos are great man! You’ve got a new fan.